1/2 x 1/4-inch solid 14K gold St. Christopher Medal. Our 3" Gold St Benedict Crucifix" features our money-back guarantee. This St. Brigid of Ireland Tiny Saint charm can be clipped on to apparel, backpacks, necklaces, bracelets, keychains and anything you can imagine! About the size of a penny, it's made of soft, rubbery PVC and is super-durable. For anyone with a devotion to Saint Brigid of Ireland, this Tiny Saint charm makes a fun religious gift for any occasion. The packaging even features a biography and information about the devotion. This St. Dymphna Tiny Saint charm can be clipped on to apparel, backpacks, necklaces, bracelets, keychains and anything you can imagine! About the size of a penny, it's made of soft, rubbery PVC and is super-durable. For anyone with a devotion to Saint Dymphna, this Tiny Saint charm makes a fun religious gift for any occasion. The packaging even features a biography and information about the devotion. This St. John the Evangelist Tiny Saint charm can be clipped on to apparel, backpacks, necklaces, bracelets, keychains and anything you can imagine! About the size of a penny, it's made of soft, rubbery PVC and is super-durable. For anyone with a devotion to Saint John the Evangelist, this Tiny Saint charm makes a fun religious gift for any occasion. The packaging even features a biography and information about the devotion. This St. Lucy Tiny Saint charm can be clipped on to apparel, backpacks, necklaces, bracelets, keychains and anything you can imagine! About the size of a penny, it's made of soft, rubbery PVC and is super-durable. For anyone with a devotion to Saint Lucy, this Tiny Saint charm makes a fun religious gift for any occasion. The packaging even features a biography and information about the devotion. This St. Andrew Tiny Saint charm can be clipped on to apparel, backpacks, necklaces, bracelets, keychains and anything you can imagine! About the size of a penny, it's made of soft, rubbery PVC and is super-durable. For anyone with a devotion to Saint Andrew, this Tiny Saint charm makes a fun religious gift for any occasion. The packaging even features a biography and information about the devotion. 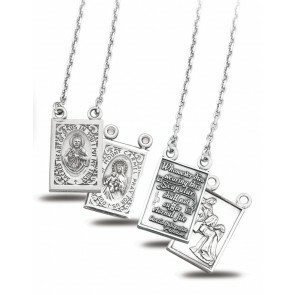 This Sterling Silver Two Piece Scapular Medals has passed our quality control assessment and meets our strict criteria to be a Catholic Shop product. Buy with confidence.